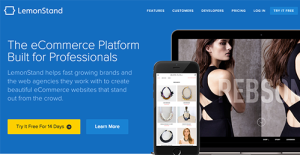 LemonStand is an eCommerce platform for fast-growing businesses and budding entrepreneurs that flaunts a hyper-customization atmosphere with access to all website codes. It is also noted for its scalability and its capacity to keep pace with their users, whether they’re the business owner or the developer. With its easy-to-use interface, creating beautiful eCommerce websites that really perform is a breeze. An area where LemonStand really stands out is the customizability of its entire user experience. Users can utilize front-end techniques with flexibility to create a beautiful interface that matches their branding. From choosing products to proceeding with checkout, every aspect can be customized to avoid confusion for your customers and ensure more conversions. It also lets you focus on increasing your sales as it takes care of all significant aspects of your online business – such as selling retail, digital products, and recurring subscriptions. Offering wholesale and volume pricing is also accomplished with ease. The shopping cart software has a content management system that enables you to create and publish content effectively. Its publishing tools are straightforward whether it’s for blog posts, web pages, or announcements. This streamlines the creation of content to educate your customers about your product and services, increase customer engagement, and grow your website traffic. LemonStand can be integrated into a wide array of services with its developer-friendly API, integrations, and tools to meet with your business’ various eCommerce needs. It also adapts to your workflow and scale to match with your business and keep costs under control. Its enterprise-grade SaaS platform handles all your e-commerce platform’s support, maintenance, and infrastructure to let you focus on growing your business. Create a unique brand experience on your platform the way you want, including using front-end frameworks such as React, Bootstrap, and Angular. It also works seamlessly with the popular Twig language for a robust theming engine. The software also has free open source themes to fit your preferences and business branding. Guide your customers through the checkout process with a straightforward platform and keep them in your domain to avoid confusion and cancellation of their purchase. Depending on what works for your business, you can add multiple modes of payment, checkout designs, and flows. Incorporating A/B and multivariate testing is also available. Content creation, presentation, design, and publishing is fully customizable. Build a connection with your content and commerce with links in your content to find, learn, and buy the product to make it convenient for them when they decide to purchase your product or service. It has a built-in WYSIWYG editor for easy publishing of web pages, blog posts, and web announcements, among others. Improve your website’s searchability with full control over your meta-data, URL structure, and other relevant aspects to boost your SEO. Present, setup, and sell your products the way you want in the platform’s custom fields. No matter how complex your preferred arrangement is, LemonStand can cater it – whether its digital products, recurring subscriptions, advanced discount engine. Incorporate up-sells and cross-sells with ease for product extras and related products, respectively. It also supports volume, wholesale, and group-based pricing. It seamlessly adapts to your team’s workflows and scales with its user-friendly interface for store owners and their staffs and customers. It also takes care of various aspects such as sales and conversion analytics, automated inventory management, advanced tax configuration, and customizable shipping rate tables with up-to-date carrier rates. Automatic updates and auto-scaling let you focus on your business as the software takes care in ensuring your platform is updated, supported, and maintained. It has a site-wide SSL, PCI/DSS compliant infrastructure, Global CDN, and development sandbox stores to provide you with top-notch support and service. Depending on the scale of your business, LemonStand has pricing options to match with your needs from $19 to $199 a month. You’ll ensure all features offer targeted solutions so you won’t waste your team’s time and effort in tools that just bulk-up the package but don’t offer value to your business. What Problems Will LemonStand Solve? A/B Testing Checkout Pages to Optimize Conversion – The biggest source of lost sales is cart abandonment during the checkout process. Either through LemonStand’s flexible theming engine which allows complete customization of the checkout process or by integrating a tool like Optimizely along with advanced analytics tools like Google Analytics, KissMetrics and others, businesses can easily test multiple designs and processes for the checkout and analyze conversion to identify ways to continuously improve them and grow sales. Digital Products, Recurring Subscriptions, Wholesale Pricing – Businesses are increasingly wanting to grow by creating multiple streams of revenue by offering not just traditional retail goods, but also digital products such as eBooks, Audio Books, Training Videos, etc., subscription products such as subscription boxes which create a continuous stream of recurring revenue, or even mixing retail and wholesale selling with the ability to discount by customer group and/or volume. Without the need for expensive and complicated third party add-ons, LemonStand supports selling all these types of products and advanced selling models right out of the box. Extending and Integrating – For growing businesses with advanced requirements who want to either extend LemonStand’s functionality (i.e. dynamically create custom products and render them) or integrate to third party applications even if they’re on-premise (i.e. custom integration to MS Dynamics GP ERP), LemonStand offers a robust and elegant developer-friendly API along with WebHooks support and extensive developer documentation. If you are considering LemonStand it might also be sensible to analyze other subcategories of Best eCommerce Software collected in our base of SaaS software reviews. It's crucial to realize that virtually no app in the eCommerce Software category is going to be an ideal solution able to fulfill all the requirements of various company types, sizes and industries. It may be a good idea to read a few LemonStand reviews first as some services might dominate just in a really narrow group of applications or be created with a very specific industry in mind. Others may work with an intention of being easy and intuitive and therefore lack complex elements needed by more experienced users. You can also find apps that cater to a broad group of users and give you a complex feature toolbox, but this usually comes at a more expensive price of such a software. Ensure you're aware of your requirements so that you purchase a solution that offers all the elements you search for. How Much Does LemonStand Cost? We realize that when you make a decision to buy Shopping Cart Software it’s important not only to see how experts evaluate it in their reviews, but also to find out if the real people and companies that buy it are actually satisfied with the product. That’s why we’ve created our behavior-based Customer Satisfaction Algorithm™ that gathers customer reviews, comments and LemonStand reviews across a wide range of social media sites. The data is then presented in an easy to digest form showing how many people had positive and negative experience with LemonStand. With that information at hand you should be equipped to make an informed buying decision that you won’t regret. What are LemonStand pricing details? What integrations are available for LemonStand? Pros: I'm often wondering if LemonStand's customization capacity has limits at all! My experience with it has been nothing but flawless and impeccable, and I see they're not planning to stop enriching the product map with new features and assets. I coded my webstore to make it more personal, including even customer emails upon their purchases and orders, which is a really unique feature for an ecommerce platform. LemonStand can fulfill every need that comes to your mind, as complex and impossible as you think that is. Cons: They've just introduced the second version, so there are still flexibility issues that have to be taken into account. I find it a bit frustrating not to be able to adjust product discounts, but as an expert user of Version 1, I know they will deliver nothing but perfection. And I'm eager to see that! Pros: LemonStand is a perfect platform in terms of back-end performance and management, as it clarified ecommerce UIs to the extent of enabling tech-savvy users to configure their sites and e-stores, and to document information in an amazingly accurate way. The best side of LemonStand is that it is a platform one enjoys to use, and it turns the experience of running an e-store into an entertaining task. Cons: I'll have to nitpick here, because I really can’t think of an issue worth of mentioning. They could introduce a blog/news feature, eventually, even if their marketing strategy insinuates that they’re already doing it. Still, I'm working on 5 new stores at the moment, and none of the clients seem to even notice it. After all, it is just a nice addition, not an essential feature that would devalue the final product. Creating beautiful custom stores in no time! If you need more information about LemonStand or you simply have a question let us know what you need and we’ll forward your request directly to the vendor.